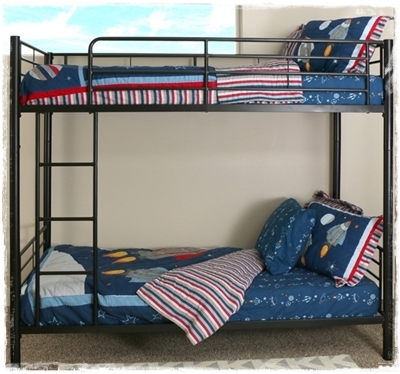 Metal twin bunk beds are the most economical and easiest by far to assemble. 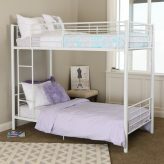 Twin over twin bunk beds are the most common size and these are frequently used in teen rooms, dorm rooms, or small apartments. Usually, they consist of one twin size mattress stacked over another twin mattress accommodating two single sleepers. Twin metal bunks free up much more room space for room sharing children and teens. 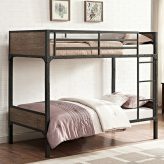 They make the perfect tween, teen or college bunk bed as they are study yet easy to move. Our metal bunk beds can be used by adults as the weight limit on most is 250 lbs per twin bed and 300 lbs per full size metal bunk. 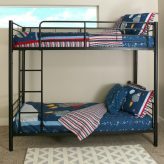 Metal Twin Bunk Beds – the most popular, economical choice! Another nice feature of metal bunks is the contemporary simplistic design. They blend easily into any decor. Full length guardrails and fixed ladders provide optimum safety. Many of our metal bunk beds have durable powder coated finish which withstands more use while maintaining that “new” look. 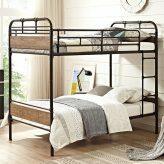 Consider metal twin bunk beds for your dorm room, teen room, vacation home, cabin or lodge!